I hope everyone had a nice Memorial Day holiday. I love three day weekends because then it also means that the work week is only four days long. Tomorrow is already Wednesday and the weekend is just around the corner. I designed a few new cards over the weekend. As soon as I scan or photograph them, I'll be sure to post them here. A few of my Captain & Tennille friends have commented that I don't mention C&T enough on my blog. I appreciate the feedback and will rectify the situation shortly (wow, that sounds like one of those canned responses). Each year in the U.S. of A. By placing their lives in harm's way. Whose sacrifice we'll not forget. 'Til God gave them rest by his hand. By Freedom salute we The Brave! Now I've got that darn Alice Cooper song playing in my head...hee hee hee. Yes, no more pencils, no more books. Today was the last day of school. It was quite obvious when I drove home from work today and noticed all of the kids playing outside. They had such happy looks on their faces. The kids are now free to enjoy the summer. Earlier this week, my youngest niece asked me if I had to work during the summer. I guess she figured since she doesn't have to go to school, I shouldn't have to work. When I told her that I do have to work during the summer, she said, "That's not fair." I agree. Wouldn't it be great if the working world observed the school schedule; 2 weeks off at Christmas, another week at Easter and the entire summer off not to mention the various Staff Development days! Here's to the unofficial start of summer! Today was the Rachel Ray autograph session at Sur La Table. We arrived at about 1:45pm and there was already quite a long line. I was "this close" to leaving because I just figured that there was no way she'd get to us by 5:00pm. It seemed like there were too many people in front of us. One of the employees of Sur La Table was walking through the line asking people how they wanted their book signed. He wrote the message on a sticky note and placed it on the book so that Rachel knew exactly what she was to write. I told him that we'd like to have it signed to Bill & Melanie. My husband then said, "Make that Melanie & Bill." I asked the employee if we stood any chance of actually getting an autograph and he said that they can usually do 300 autographs in two hours and there were definitely not 300 people in front of us. That made me feel better so we decided to stay. A very nice lady named Sherilyn was in front of us so we talked with her quite a bit. She was getting the autograph for her daughter. We finally reached the front of the line at 4:15pm. We said, "Hi Rachel" and she said "Hi guys." She signed our book and then we thanked her and she said, "You're very welcome" and then we left. It was very well organized and the employees kept the line moving quickly so that everyone would have a chance to get Rachel's autograph. Rumor has it that some people started lining up at 9:30am so that they were sure to get an autograph. As I've said before, I'm not a patient person. I would have gone crazy waiting in line that long. We waited 2 1/2 hours and that was long enough for me. I'm very glad I didn't leave once I saw how long the line was. It was definitely worth the wait! We ate at a new microbrewery tonight. It's called Square One and it's located in the Lafayette Square area. Since it was nice and warm (84 degrees), we decided to eat in the beer garden. The food is wonderful and the beers are great. If you live in the St. Louis or you are here for a visit, be sure to check it out. We have lived in this house for 10 years and have seen our share of wildlife. We've had the usual rabbits, squirrels, chipmunks, deer and even a snake or two. I even saw a rabbit playing hide and seek with a red fox in our backyard (the rabbit won; the fox gave up and left). We also were visited by some pesky voles one year. Last week, I noticed a possum sitting in our backyard next to the bay window. I was hoping that he was just moving through and wasn't going to stick around. Well, last night I had the windows in the front of the house open and our cat, Greta, kept running back and forth between the living room and the dining room meowing at something outside. I figured that she probably saw some birds or even the geese from the pond across the street. I finally decided to go see what she was looking at. Much to my surprise, this baby possum was sitting on our front porch about 1 1/2 feet from the window. He was sitting up on his hind legs and when he saw me at the window, he actually hissed at me. Anyone who has ever seen a possum knows that they are not the cutest animals in the world. In fact, they're downright freaky looking. In case anyone is wondering, baby possums are no cuter than their parents. This one was about eight inches long not including the tail. The tail was about 12 inches long. After it finished hissing at me. it ran to the end of the porch and disappeared into the bushes. I'm sure his mother is in the vicinity. I'm also pretty sure that he has siblings. I'm currently doing a google search for possum repellent! The first one was made with the All I Have Seen stamp set. I used the linen background stamp and "friendship" from the Wonderful Words set. I embossed the image with iridescent ice embossing powder for a glittery effect. The next two were made with the Basket Full of Fun set. This set includes a basket and a bucket and you can fill it with flowers, apples, knitting, etc. I used "joy" from Small Script for the second card and the crosshatch background on the third card. Click on the above photos for a close-up view. I have a few new designs in my head right now and will hopefully be able to transfer them to card stock within the next few days. I really do need to start planting my flowers, though, because I have had two full flats just sitting on my front porch for the past 10 days. It's been too cold and rainy to plant them. I would like to be able to get them into the ground before Saturday when we are having 3 yards of mulch delivered. 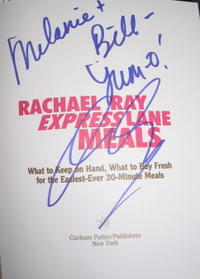 I went to Sur La Table in Plaza Frontenac this evening to purchase Rachel Ray's latest book, "Express Lane Meals." I purchased the book specifically at Sur La Table so that I could get a line ticket for the book signing on 5/21. That's right; Rachel will be here on Sunday to sign her book. The autograph session is from 3:00pm to 5:00pm. After I purchased the book, the very helpful lady behind the counter told me to plan on arriving by noon. WHAT? I'm not very patient and I really don't like standing in line. I can't imagine that I would need to arrive three hours ahead of time. Given that there is a limited number of line tickets (I'm number 168), I assumed that everyone with a line ticket would get an autograph. Wrong! Possession of a line ticket does not guarantee an autograph. There really aren't too many celebrities that I even want to meet much less for whom I'm willing to stand in line to do so. Now it goes without saying that I would stand in line all day in order to meet Toni & Daryl (aka Captain & Tennille), even though I've already met them numerous times. Likewise, Bill would stand in line all day (probably all week) in order to have the chance to meet Stevie Nicks. Burrrr...it's cold. It feels more like early March than May 11. The cool weather is supposed to stick around for another week. We have tickets for the Cards/Diamondbacks game tomorrow night. Rain and cold temperatures are in the forecast so I'll be sure to take an umbrella...and a winter coat! I'm working on a few new card designs and will post them here this weekend. I'm definitely making good use of the new stamp sets I purchased. The 2006-2007 Stampin' Up catalog will be released July 1 and I can't wait. I'm sure there will be more sets that I just have to have! It's a never ending cycle...hee hee hee. We spent a long weekend in Chicago. We flew up on Thursday morning and flew back yesterday afternoon. We walked the magnificent mile, went to the top of the Hancock Building, visited Navy Pier and Millennium Park, went to a Whitesox game, took an architectural river tour, visited Shedd Aquarium, and, needless to say, ate a lot of great food. We did not go to the top of the Sears Tower as we had done this on one of our previous visits to Chicago. 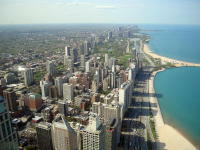 This picture was taken from the top of the Hancock Building looking north. The lake was really clear and blue this day. We didn't take a lot of pictures since we have a lot of pictures of Chicago from previous trips. I had planned to take pictures at the Whitesox game but, unfortunately, my battery died when we arrived at the game and I didn't have the spare one with me. We took several pictures with our camera phones so all is not lost. A stadium photographer also took our picture at the game and as soon as I receive the prints, I'll post one here for you to see. Speaking of the Whitesox, the thing that amazed me was that it wasn't a sellout, or even close to it. I guess I'm just used to the crowds at Busch Stadium. The Cardinals seem to have quite a few sellouts even without a World Series Championship title or a new stadium. Anyway, the White Sox were playing the Royals. I guess technically we should have rooted for the Royals since they're a Missouri team but we didn't want to have beer dumped on our heads (or worse) so we rooted for the White Sox. They ended up losing 5 to 4. We have two new microbreweries to add to our list; Goose Island and Piece. Both places have great food and beer. If I had to choose, I'd say the best beers were the brews at Piece. Their Dysfunctionale and their Worryin' Ale are outstanding! We ate dinner at Mia Francesa on Saturday. Although the tables are a little close (OK, very close), the food is wonderful. I had the roasted tilapia and Bill had the four cheese and spinach pasta. We had a wonderful flourless chocolate lava cake for dessert. We will definitely visit Mia Francesca on future trips to the Windy City! One thing that Chicago has that St. Louis doesn't is excellent public transportation. We never used a cab the entire trip, even to and from the airport. The El lines are very convenient to almost every attraction. They are very easy to navigate and, with the exception of the two Damen stops on the blue line, very easy to follow. The time seemed to fly by so quickly as it always does when you're on vacation. All in all, we had a great time. By the way, it's Toni Tennille's 66th birthday today! Happy birthday Toni.